The new Mayor for Medlar-with-Wesham was installed at the meeting held on 19th May. The outgoing Mayor, Cllr Michael Devaney handed over the chain of office to the new Mayor Cllr Linda Nulty. In proposing Cllr Nulty, Cllr Devaney added that he was certain that she would fulfil her duties in an exemplary way and reflected on the work she has done for the Town for very many years both at the Town Council and the Borough Council. The proposition was seconded by Cllr Geoff Dixon. Cllr Nulty paid tribute to the retiring Mayor and Mayoress, Mrs Caroline Devaney, adding that she felt that they had been excellent ambassadors for the Town during their year of office. Cllr Devaney was presented with a 'Past Mayors Badge'. The Mayor then proposed Cllr Alan Clayton to be Deputy Mayor which was seconded by Cllr David Ogden. 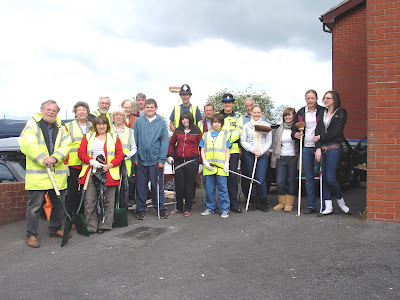 Please come along (to Wesham Community Centre) and help on Sunday June 7th at 10.00am ! !